Who is the 100000th 'Cernois'? From 3 to 5 July, CERN hosted the fifth EuroPython Conference bringing together 300 users of Python, an open source programming language, which is more and more appreciated, especially at CERN. The local organisation of Euopython 2006 was managed by a small team from the PH/SFT group. 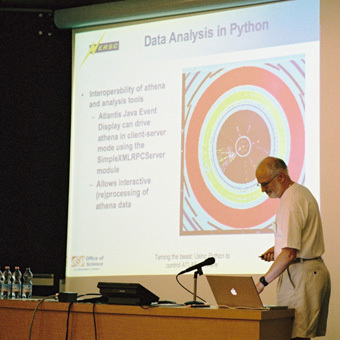 Above, David Quarrie presenting the use of Python in Atlas analyses. If you visited Building 40 at the beginning of July, you may have come across a long orange and yellow snake. This had no relation with the Football World Championship! It was just the mascot of the fifth EuroPython Conference that saw almost 300 software developers, designers and business people gathering at CERN for the annual meeting of the European Python community. Python is an open source programming language actively used in industry and academia for a wide variety of purposes. As CERN decided to host this conference, it is perhaps not surprising to learn that Python is increasingly used in our Laboratory in both computing and physics application domains. For example, Python is used in the interface with the Grid by three of the big LHC physics experiments: CMS, ATLAS and LHCb. The CDS CERN database also uses Python, especially for the projects Invenio (digital library system) and Indico (event management tool). According to Vincenzo Innocente, who works for the CMS experiment, Python is very easy to learn. Thus, it's very good for rapid prototyping and is really useful for the many temporary members who have to work on projects at CERN, especially internship students. 'Python can easily be used as a glue' said Vincenzo Innocente. Thanks to Python, it is possible to interface many programs and make them work together. Hundreds of talks were presented during the three days of the conference and covered a wide range of subjects, from examples of success stories using Python in companies and research laboratories to educational talks and tutorials on how to use new features in Python itself. Frameworks written in Python that help to ease the life of developers and users were also presented. The conference was also an opportunity for developers to meet and work together: many spent the rest of the week at CERN in crowded Sprint-sessions working all day long for some of the flagship Python projects. Who knows? Perhaps the next great Python feature was born at CERN! Python is often represented by a snake which seems an obvious choice... However, the name of this programming language has nothing to do with the reptile. Its inventor, Guido van Rossum, actually named it in reference to Monty Python, a group of British actors and humorists famous for their hilarious films, especially 'The Holy Grail'.